Find Spoken Word Poetry Hotspots for National Poetry Month on SpokenWordNewYork.com! 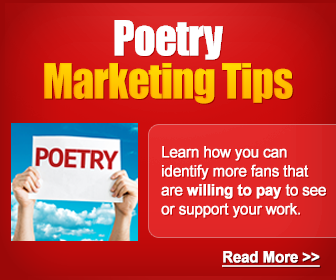 April is National Poetry Month – Celebrate the ART of POETRY! Throughout the month of April, poets and poetry enthusiasts alike celebrate the form of literature that we love so much, in order to raise awareness all around the country. National Poetry Month was established in 1996 by the American Academy of Poets and was inspired by the success that Black History Month and Women’s History Month were met with. I, personally, have loved poetry since I was very young. It always caught and held my attention more than regular prose; there seemed to be a freedom to it that the average book didn’t possess. It wasn’t long before I was writing my own poetry (which was admittedly terrible at first…and still needs study. I am not a poet, by the way. ), and seeking friends who shared my own interest. Some of my best experiences in NYC, with my friends, are spending the evening at a poetry café or club, watching a great stage performance by a veteran or an up-and-coming artist or just hitting up an Open Mic to see what’s fresh, what’s new, and what’s happening in the Spoken Word Poetry community. I am positive that poetry will be something that is a part of my life forever. It is something that I create, sometimes share, and SEE in the world all around me. And I love the Poetry of life! National Poem In Your Pocket Day is celebrated on the last Thursday in April. This year, it falls on April 28, 2016. April is National Poetry Month – Celebrate the ART of POETRY! Read. Write. Get out & Recite. Enjoy POETRY!